This recipe is for the playgroup moms, who asked time and again as our children learned to crawl and then walk and then ride school buses, and for the family members who asked at Thanksgiving, and again at Christmas, and at Thanksgiving, and Christmas…. This is for the friends at parties and picnics and playdates, who could not believe that this cake is vegan, and who were happy that I brought the same thing, every time, saving me lots of “what to bring” stress. You’ve probably forgotten that you asked, but thanks for asking. Here it is. Sorry it took me so long. Mix the above ingredients in a small bowl and set aside. Mix the first three wet ingredients thoroughly in a large bowl; then mix in the pumpkin. Add the dry ingredients to the wet ingredients and mix thoroughly. Rub the bottom and sides of a 13×9-inch ceramic baking pan with organic canola oil. Add the cake batter to the pan and smooth with a spoon. Bake at 350°F for 34 minutes. Let cool. I avoid canned foods, but pumpkin is one exception. Pumpkin is a great source of beta-carotene, vitamin A. Canola oil is a great source of omega-3 EFAs. The natural salt adds minerals including iodine, which is important in a plant-based diet. Both canola oil and pumpkin are highly anti-inflammatory. 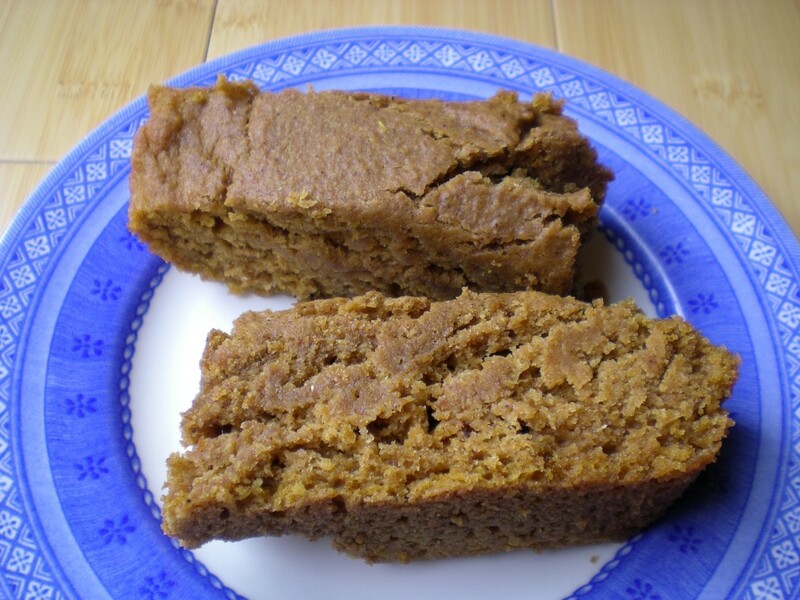 Like most pumpkin cakes, breads, or pies, this one tastes best the next day. But you probably won’t wait. Enjoy it. © Copyright 2011, Laura J. Rongé, Ciel Bleu Media, healthiveg.com. All rights reserved. Disclaimer. This article is not intended as medical, nutritional, or other professional advice. This entry was posted in Superfoods, vegan, Vegan Cake Recipes and tagged vegan, veganic. Bookmark the permalink. Thank you for posting this recipe and the nutrition information with it. I think that we may have been the ones asking at Christmas and Thanksgiving. (I do not think that we stopped asking in between!) I look forward to following. The world is a better place with this pumpkin cake! Congrats on the launch. I may be a bit biased in my opinion, but this pumpkin cake is the best. My daughter and I have a conditioned response to run for the kitchen whenever we catch the smell of it in the oven. Waiting for the next day may be suggested but we rarely give it that much time. Simply good stuff!!!! so trying this – it sounds delish! Thank you, Leah! I think it should work fine. Vietnamese cinnamon is strong, so you might want to increase the amount slightly with a substitute. All of the spices can be increased or decreased to your preference. Enjoy it!